He is said to have been born with two tongues, one of which gradually lessened until it became no way inconvenient, though both were originally of the same size; this is mentioned in the Philosophical Transactions, No. 486, for 1748. Nov. 9, 1664, at Worstead in Norfolk; of which parish his father Edmund, who survived him, was vicar. He was educated under his father; and made such a progress in the Greek and Latin tongues, that, from his first entrance into the university, he was thought an extraordinary young man. On Feb. 17, 1679—80, he was admitted into ‘Caius-college, Cambridge, of which his father had been fellow, under the tuition of John, afterwards sir John Ellys, one of the senior fellows. Here he prosecuted his studies with the greatest vigour, and was instructed in the mathematics by Mr. (afterwards sir) Isaac Newton, then fellow of Trinity-college and Lucasian professor, amongst a select company, to whom that great man read lectures in his own private chamber. 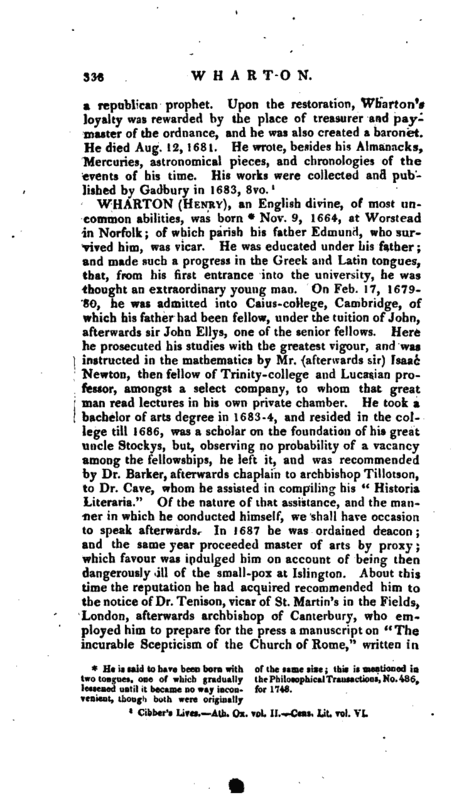 He took a bachelor of arts degree in 1683-4, and resided in the college till 1686, was a scholar on the foundation of his great uncle Stockys, but, observing no probability of a vacancy among the fellowships, he left it, and was recommended by Dr. Barker, afterwards chaplain to archbishop Tillotson, to Dr. Cave, whom he assisted in compiling his “Historia Literaria.” Of the nature of that assistance, and the manner in which he conducted himself, we shall have occasion to speak afterwards. In 1687 he was ordained deacon; and the same year proceeded master of arts by proxy; which favour was indulged him on account of being then dangerously ill of the small-pox at Islington. 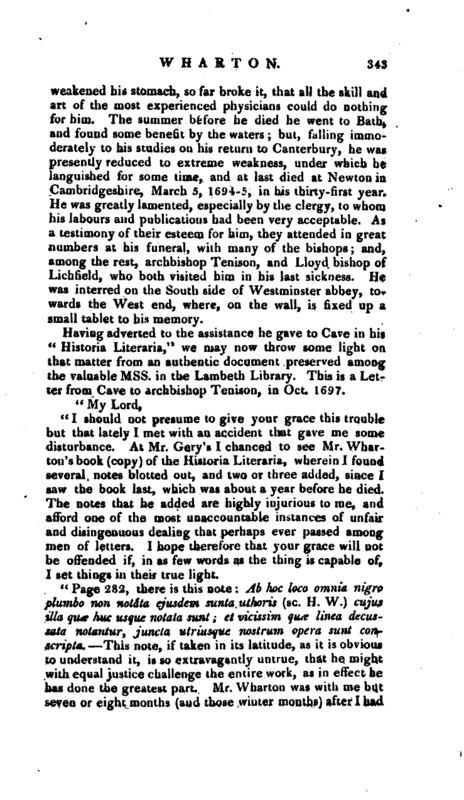 About this time the reputation he had acquired recommended him to the notice of Dr. Tenison, vicar of St. Martin’s in the Fields, London, afterwards archbishop of Canterbury, who employed him to prepare for the press a manuscript on “The incurable Scepticism of the Church of Rome,” written in | Latin by Placette of Hamburgh. This Wharton translated into English and epitomized. Tenison also recommended him to lord Arundel of Trerice, as tutor for his son. Soon after being presented to archbishop Sancroft, his grace put into his hands, in April 1788, the manuscript of archbishop Usher’s dogmatical history of the Holy Scriptures, which he published, in 4to, under the title, “J. Usserii, &c. Hist. Dogmatica controversial inter orthodoxos et pon-r tificios de scripturis, &c.” to which he added an “auctarium,” or supplement. He also published before and about this time several treatises against popery, among which are, 1. “The Speculum Ecclesiasticum considered, inits false reasonings and quotations,” Lond. 1687, 4to. The “Speculum Ecclesiasticum” was a production of Thomas. Ward, whom we have noticed already. 2. “A treatise proving Scripture to be the rule of Faith, writ by Reginald Pecock, bishop of Chichester, before the reformation, about 1450,” Lond* 1688, 4to. 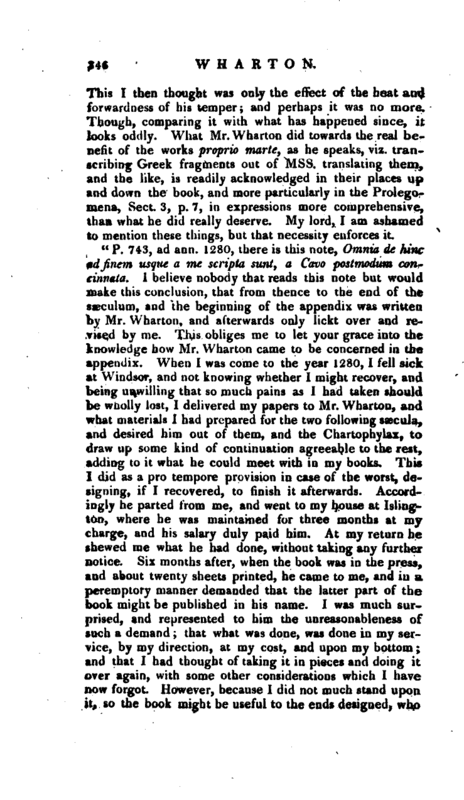 This, to which Mr. Wharton prefixed a preface on the same subject, is the only production of that learned prelate which has been pub-, lished. 3. “A treatise of the Celibacy of the Clergy, wherein its rise and progress are historically considered, 7 * ibid. 1688, 4to. In this he proves that the celibacy of the clergy was not enjoined either by Christ or his apostles; that it has nothing excellent in itself; that the imposition of it is unjust, and that, in point of fact, it was never universally imposed or practised in the ancient church. 5. A, translation of Dellon’s” History of the Inquisition of Goa. n 6. 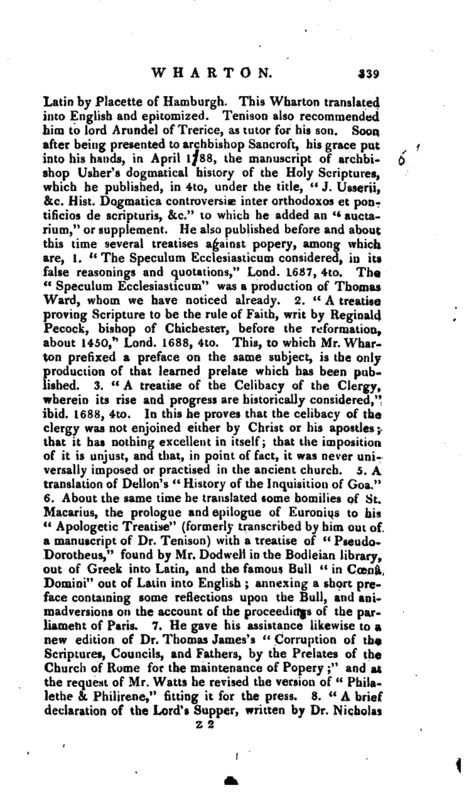 About the same time he translated some homilies of St. Macarius, the prologue and epilogue of Euronius to his “Apologetic Treatise” (formerly transcribed by him out of a manuscript of Dr. Tenison) with a treatise of “PseudoDorotheus,” found by Mr. Dodwell jn the Bodleian library, out of Greek into Latin, and the famous Bull “in Ccena Domini” out of Latin into English annexing a short preface containing some reflections- upon the Bull, and animadversions on the account of the proceedings of the parliament of Paris. 7. 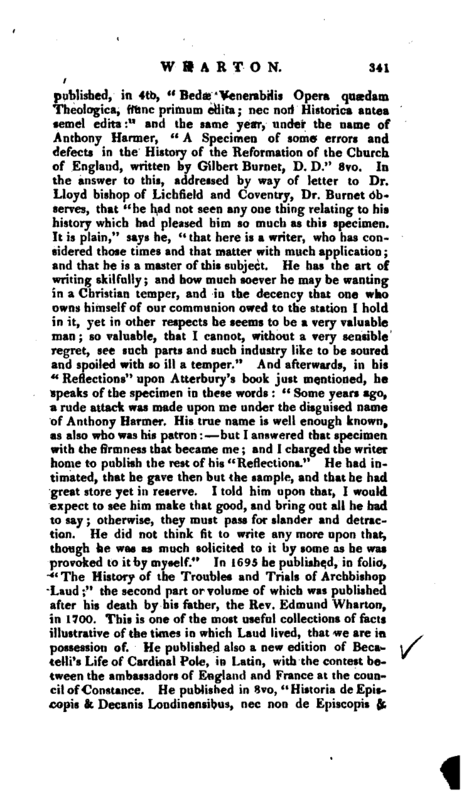 He gave his assistance likewise to a new edition of Dr. Thomas James’s “Corruption of the Scriptures, Councils, and Fathers, by the Prelates of the Church of Rome for the maintenance of Popery;” and at the request of Mr. Watts he revised the version of “Philalethe & Philirene,” fitting it for the press. 8. “A brief declaration of the Lord’s Supper, written by Dr. Nicholas | Ridley, bishop of London, during his imprisonment. Witfo some other determinations and disputations concerning the same argument, by the same author. To which is annexed an extract of several passages to the same purpose out of a book entitled * Diallecticon,’ written by Dr. John Poynet, bishop of Winton in the reigns of Edward VI. and queen Mary,” 1688, 4to. 9. “The Enthusiasm of the Church of Rome demonstrated in some observations upon the Life of Ignatius Loyola,” 1688, 4to. In this year (1688) although as yet no more than a deacon, he was honoured by Bancroft with a licence to preach through the whole province of Canterbury; a favour granted to none but him during Sancroft’s continuance in that see. 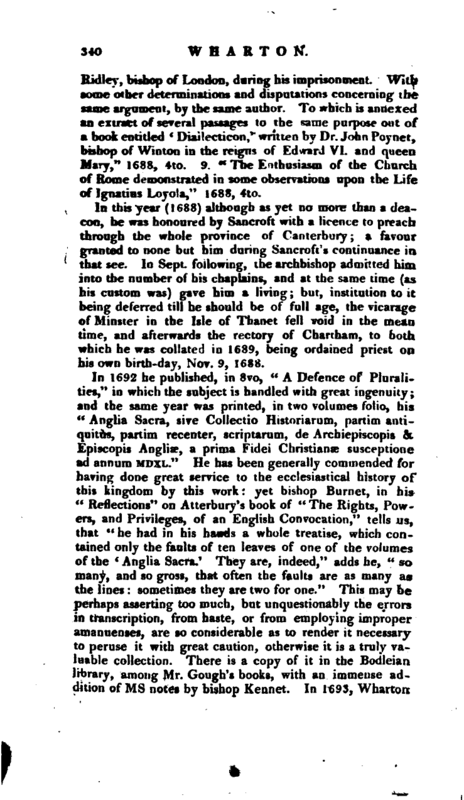 In Sept. following, the archbishop admitted him into the number of his chaplains, and at the same time (a* his custom was) gave him a living; but, institution to it being deferred till he should be of full age, the vicarage of Minster in the Isle of Thanet fell void in the mean time, and afterwards the rectory of Chartham, to both which he was collated in 1689, being ordained priest on his own birth-day, Nov. 9, 1688. In 1692 he published, in 8vo, “A Defence of Pluralities,” in which the subject is handled with great ingenuity; and the same year was printed, in two volumes folio, his “Anglia Sacra, sive Collectio Historiarum, partim antiquitus, partim recenter, scriptarum, de Archiepiscopis &, Episcopis Anglise, a prima Fidei Christianas susceptione ad annum MDXL.” He has been generally commended for having done great service to the ecclesiastical history of this kingdom by this work yet bishop Burnet, in his “Reflections” on Atterbury’s book of “The Rights, Powers, and Privileges, of an English Convocation,” tells us, that “he had in his hands a whole treatise, which contained only the faults of ten leaves of one of the volumes of the ‘ Anglia Sacra.’ They are, indeed,” adds he, “so many, and so gross.^ that often the faults are as many as the lines: sometimes they are two for one.” This may be perhaps asserting too much, but unquestionably the errors in transcription, from haste, or from employing improper amanuenses, are so considerable as to render it necessary to peruse it with great caution, otherwise it is a truly valuable collection. There is a copy of it in the Bodleian? library, among Mr. Gough’s books, with an immense addition of ms notes by bishop Kennet. Jn 1693, Wharton | published, in 4to, “Bedae Venerabilis Opera queedam Theologica, nunc primum edita; nee non Historica antea semel edita:” and the same year, under the name of Anthony Harmer, “A Specimen of some errors and defects in the History of the Reformation of the Church of England, written by Gilbert Burnet, D. D.” 8vo. 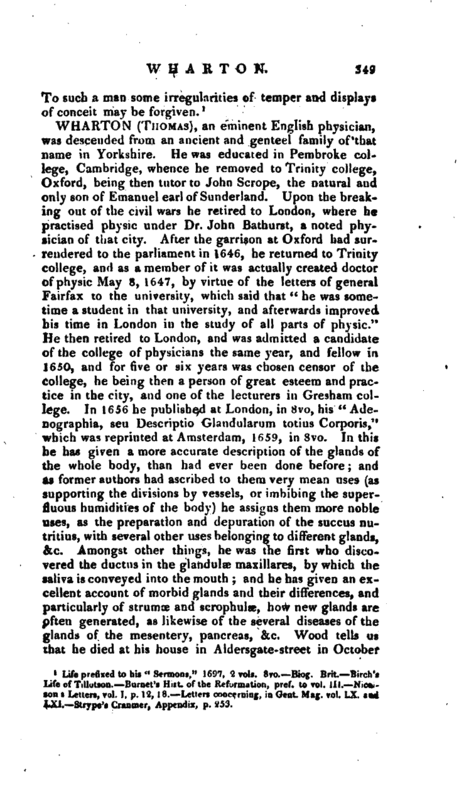 In the answer to this, addressed by way of letter to Dr. Lloyd bishop of Lichfield and Coventry, Dr. Burnet observes, that “he had not seen any one thing relating to his history which had pleased him so much as this specimen. It is plain,” says he, “that here is a writer, who has considered those times and that matter with much application; and that he is a master of this subject. He has the art of writing skilfully; and how much soever he may be wanting in a Christian temper, and in the decency that one who owns himself of our communion owed to the station I hold in it, yet in other respects he seems to be a very valuable man; so valuable, that I cannot, without a very sensible regret, see such parts and such industry like to be soured and spoiled with so ill a temper.” And afterwards, in his “Reflections’ 1 upon Atterbury’s book just mentioned, he speaks of the specimen in these words” Some years ago, a rude attack was made upon me under the disguised name of Anthony Harmer. His true name is well enough known, as also who was his patron: but I answered that specimen with the firmness that became me; and I charged the writer home to publish the rest of his “Reflections.” He had intimated, that he gave then but the sample, and that he had great store yet in reserve. I told him upon that, I would expect to see him make that good, and bring out all he had to say; otherwise, they must pass for slander and detraction. He did not think fit to write any more upon that, though he was as much solicited to it by some as he was provoked to it by myself.“In 1695 he published, in folio,” The History of the Troubles and Trials of Archbishop Laud;“the second part or volume of which was published after his death by his father, the Rev. Edmund Wharton, in 1700. This is one of the most useful collections of facts illustrative of the times in which Laud lived, that we are in possession of. He published also a new edition of Becatelli’s Life of Cardinal Pole, in Latin, with the confest between the ambassadors of England and France at the council of Constance. He published in 8vo,” Historia deEpiseopis & Decanis Londinensilxus, nee non de Episcopis & | Decanis Assavensibus, a prima sedis utriusque fundatione ad annum MDXL.“Besides these works he left several pieces behind him, about which he had taken great pains: and two volumes of his” Sermons“have been printed in 8vo since his death. 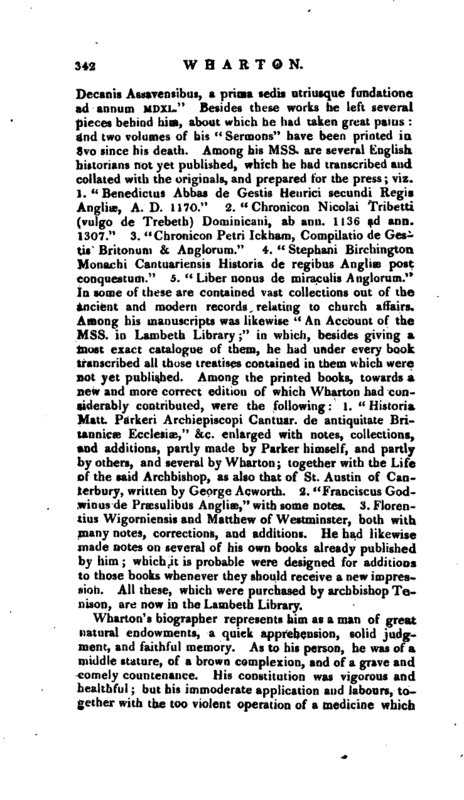 Among his Mss, are several English historians not yet published, which he had transcribed and collated with the originals, and prepared for the press; viz. 1.” Benedictus Abbas de Gestis Henrici secundi Regis Angliae, A. D. U70.“2.” Chronicon Nicolai Tribettt (vulgo de Trebeth) Dominicani, ab ann. 1136 ad ann, 1307.“3?” Chronicon Petri Ickham, Compilatio de Gestis Britonum & Anglorum.“4.” Stephani Birchington Monachi Cantuariensis Historia de regibus Angliae post conquestum.“5.” Liber nonus de miraculis Anglorum.“In some of these are contained vast collections out of the ancient and modem records relating to church affairs. Among his manuscripts was likewise” An Account of the Mss. in Lambeth Library“in which, besides giving a most exact catalogue of them, he had under every book transcribed all those treatises contained in them which were not yet published. Among the printed books, towards a new and more correct edition of which Wharton had considerably contributed, were the following: 1.” Historia Matt. Parkeri Archiepiscopi Cantuar. de antiquitate Britaonicae Ecclesiae,“&c. enlarged with notes, collections, and additions, partly made by Parker himself, and partly by others, and several by Wharton; together with the Life of the said Archbishop, as also that of St. Austin of Canterbury, written by George Acworth. 2.” Franciscus Godwinus de Praesulibus Angliae," with some notes. 3. Florentius Wigorniensis and Matthew of Westminster, both with many notes, corrections, and additions. He had likewise made notes on several of his own books already published by him; which it is probable were designed for additions to those books whenever they should receive a new impression. All these, which were purchased by archbishop Tenison, are now in the Lambeth Library. Wharton’s biographer represents him as a man of great natural endowments, a quick apprehension, solid judgment, and faithful memory. As to his person, he was of a middle stature, of a brown complexion, and of a grave and comely countenance. His constitution was vigorous and healthful; but his immoderate application and labours, together with the too violent operation of a medicine which | weakened his stomach, so far broke it, that all the skill and art of the most experienced physicians could do nothing for him. The summer before he died he went to Bath, and found some benefit by the waters; but, falling immoderately to his studies on his return to Canterbury, he was presently reduced to extreme weakness, under which he languished for some time, and at last died at Newton in Cambridgeshire, March 5, 1694-5, in his thirty-first year. He was greatly lamented, especially by the clergy, to whom his labours and publications had been very acceptable. As a testimony of their esteem for him, they attended in great numbers at his funeral, with many of the bishops; and, among the rest, archbishop Tenison, and Lloyd bishop of Lichfield, who both visited him in his last sickness. He was interred on the South side of Westminster abbey, towards the West end, where, on the wall, is fixed up a small tablet to his memory. "I should not presume to give your grace this trouble but that lately I met with an accident that gave me some disturbance. At Mr. Gery’s I chanced to see Mr, Wharton’s book (copy) of the Historia Literaria, wherein I found several notes blotted out, and two or three added, since I saw the book last, which was about a year before he died. The notes that he added are highly injurious to me, and afford one of the most unaccountable instances of unfair and disingenuous dealing that perhaps ever passed among men of letters. I hope therefore that your grace will not be offended if, in as few words as the thing is capable of, I set things in their true light. "Page 282, there is this note Ab hoc loco omnia nigfo plumbo non notata ejusdem sunta uthoris (sc. H. W.) cujus ilia qua hue usque notata sunt; et mcissim qua linea decussata notantur, juncta utriusque nostrum opera sunt cor$­scripta. This note, if taken in its latitude, as it is obvious to understand it, is so extravagantly untrue, that he might with equal justice challenge the entire work, as in effect he has done the greatest part. Mr. Wharton was with me but seven or eight months (and those winter months) after I had | resumed what I had long thrown aside; a time much too short for a work of that bigness, if he had claimed the whole. The four first specula 1 had drawn up, and still have by me under the hand of my then amanuensis some years before Mr. Wharton ever saw an university: to which I added several things afterwards, mostly extracted out of the English lives which I had published long before I ever heard of Mr. Wharton’s name. Nay, there are some passages, and those pretty large, hookt by Mr. Wharton within the compasse of his note, which I particularly remember I drew up several months after he left me, having then got some books which 1 had not before. And for all the rest (more than in the sense wherein things are acknowledged in this paper) I am as sure they were of my own doing, as I am sure of my right hand. "The whole foundation of any pretence at all was no more than this. 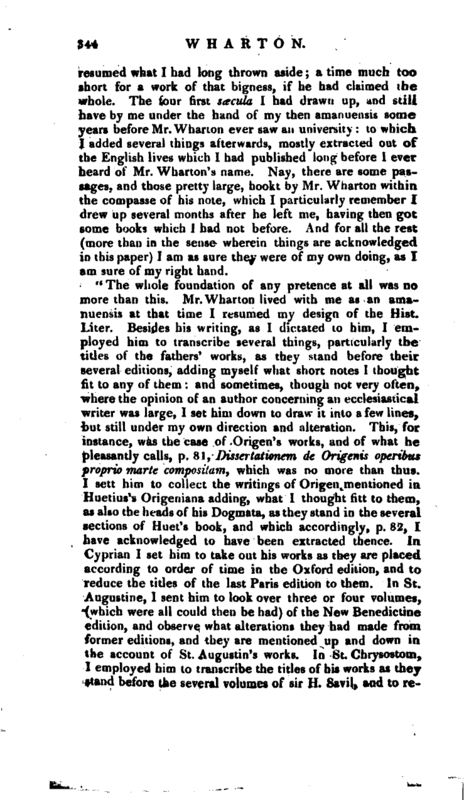 Mr. Wharton lived with me as an amanuensis at that time I resumed my design of the Hist. Liter. Besides his writing, as I dictated to him, I employed him to transcribe several things, particularly the titles of the fathers’ works, as they stand before their several editions, adding myself what short notes I thought fit to any of them and sometimes, though not very often> where the opinion of an author concerning an ecclesiastical writer was large, I set him down to draw it into a few lines, but still under my own direction and alteration. This, for instance, was the case of Origen’s works, and of what he pleasantly calls, p. 81, Dissertationem de Origenis operibus proprio martt compositarn, which was no more than thus. J sett him to collect the writings of Origen mentioned in Huetius’s Origeniana adding, what I thought fitt to them, as also the heads of his Dogmata, as they stand in the several sections of Huet’s book, and which accordingly, p. 82, I have acknowledged to have been extracted thence. la Cyprian I set him to take out his works as they are placed according to order of time in the Oxford edition, and to reduce the titles of the last Paris edition to them. In St. Augustine, I sent him to look over three or four volumes, (which were all could then be had) of the New Benedictine edition, and observe what alterations they had made from former editions, and they are mentioned up and down in the account of St. Augustin’s works. In St. Chrysostom, I employed him to transcribe the titles of his works as they stand before the several volumes qf sir H. Savil, and to | recluce those of Fr. Ducseus to them, which accordingly are sett down column-wise, p. 255, &c. In reading to me out of bishop Usher’s Bibliotheca Theologica, concerning Chrysostom, (and the like concerning some others), I ordered him to copy out several passages which you have in the bishop’s own words from p. 270, and so on. In Theodoret, I directed him to coliect’his works as they are reckoned up in Garnerius’s dissertation De Vit. et Libns Theodoriti, which I refer to p. 319. 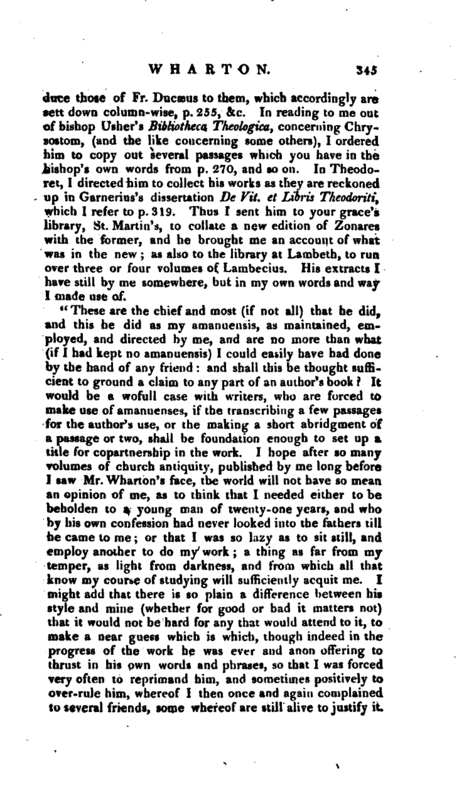 Thus I sent him to your grace’s library, St. Martin’s, to collate a new edition of Zonures with the former, and he brought me an account of what was in the new; as also to the library at Lambeth, to run over three or four volumes of Lambecius. His extracts Ihave still by me somewhere, but in my own words and way I made use of. 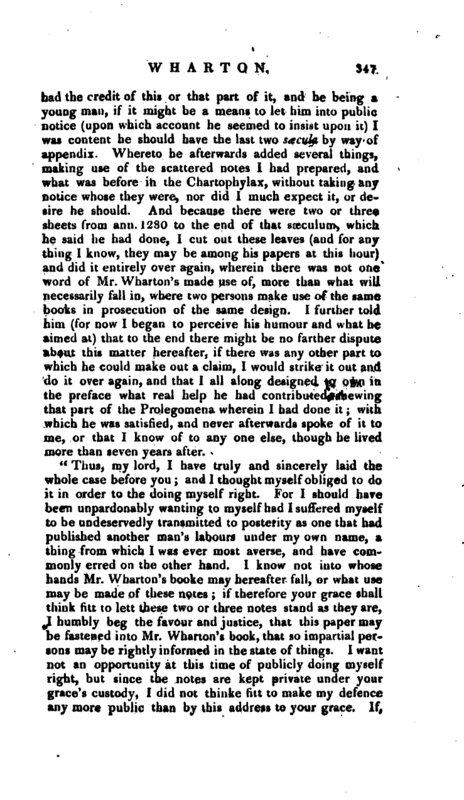 "These are the chief and most (if not all) that he did, and this he did as my amanuensis, as maintained, employed, and directed by me, and are no more than what (if I had kept no amanuensis) I could easily have had done by the hand of any friend: and shall this be thought sufficient to ground a claim to any part of an author’s book? It would be a wofull case with writers, who are forced to make use of amanuenses, if the transcribing a few passages for the author’s use, or the making a short abridgment of a passage or two, shall he foundation enough to set up a title for copartnership in the work. I hope after so many volumes of church antiquity, published by me long before I saw Mr. Wharton’s face, the, world will not have so mean an opinion of me, as to think that I needed either to be beholden to a young man of twenty-one years, and who by his own confession had never looked into the fathers till he came to me; or that I was so lazy as to sit still, and employ another to do my work; a thing as far from my temper, as light from darkness, and from which all that know my course of studying will sufficiently acquit me. I might add that there is so plain a difference between his style and mine (whether for good or bad it matters not) that it would not be hard for any that would attend to it, to make a near guess which is which, though indeed in the' progress of the work he was ever and anon offering to thrust in his own words- and phrases, so that I was forced very often to reprimand him, and sometimes positively to over-rule him, whereof I then once and again complained to several friends, some whereof are still alive to justify it. | This I then thought was only the effect of the heat and forwardness of his temper; and perhaps it was no more. Though, comparing it with what has happened since, it looks oddly. What Mr.Wharton did towards the real benefit of the works proprio marte, as he speaks, viz. transcribing Greek fragments out of Mss. translating them, and the like, is readily acknowledged in their places up and down the book, and more particularly in the Prolegomena, Sect. 3, p. 7, in expressions more comprehensive, than what he did really deserve. My lord, I am ashamed to mention these things, but that necessity enforces it. "P. 743, ad ann. 1280, there is this note, Omnia de hinc ndfinern usque a me scripta sunt, a Cavo postmodum concinnala. I believe nobody that reads this note but would make this conclusion, that from thence to the end of the sa3culum, and the beginning of the appendix was written by Mr. Wharton, and afterwards only lickt over and revised by me. 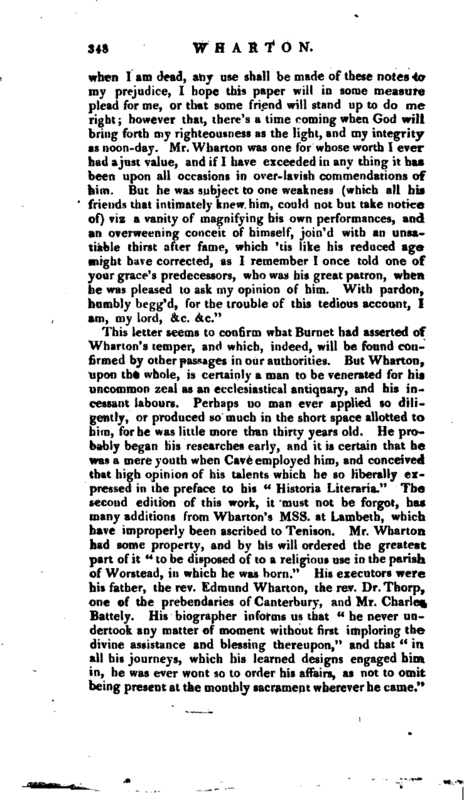 This obliges me to let your grace into the knowledge how Mr. Wharton came to be concerned in the appendix. When I was come to the year 1280, I fell sick at Windsor, and not knowing whether I might recover, and being unwilling that so much pains as I had taken should be wholly lost, I delivered my papers to Mr. Wharton, and what materials I had prepared for the two following siecula, and desired him out of them, and the Chartophylax, to draw up some kind of continuation agreeable to the rest, adding to it what he could meet with in my books. This I did as a pro tempore provision in case of the worst, designing, if I recovered, to finish it afterwards. Accordingly he parted from me, and went to my house at Islington, where he was maintained for three months at my charge, and his salary duly paid him. At my return he shewed me what he had done, without taking any further notice. Six months after, when the book was in the press, and about twenty sheets printed, he came to me, and in a peremptory manner demanded that the latter part of the book might be published in his name. I was much surprised, and represented to him the unreasonableness of such a demand; that what was done, was done in my service, by my direction, at my cost, and upon my bottom; and that I had thought of taking it in pieces and doing it over again, with some other considerations which I have now forgot. However, because I did not much stand upon it, so the book might be useful to the ends designed, who | bad the credit of this or that part of it, and he being a young man, if it might be a means to let him into public notice (upon which account he seemed to insist upon it) I was content he should have the last two ssecula by way of appendix. Whereto he afterwards added several things, making use of the scattered notes I had prepared, and what was before in the Chartophylax, without taking any notice whose they were, nor did I much expect it, or desire he should. And because there were two or three sheets from ann. 1280 to the end of that soeculum, which he said he had done, 1 cut out these leaves (and for any thing I know, they may be among his papers at this hour) and did it entirely over again, wherein there was not one word of Mr. Wharton’s made use of, more than what will necessarily fall in, where two persons make use of the same books in prosecution of the same design. I further told him (for now I began to perceive his humour and what he aimed at) that to the end there might be no, farther dispute about this matter hereafter, if there was any other part to which he could make out a claim, I would strike it out and do it over again, and that I all along designed to own in the preface what real help he had contributed, shewing that part of the Prolegomena wherein I had done it; with which he was satisfied, and never afterwards spoke of it to me, or that I know of to any one else, though he lived more than seven years after. Life prefixed to his “Sermons,” 1697, 2 vols. 8vo. Biug. Brit. Birch’s Life of Tilbtson. Durnet’s Hist, of the Refurmation, pref. to vol. 111. Nico:son s Letters, vol. I, p, 12, 18. Letters concerning, in —Gent. Mag. vol. LX. and J-XI, —Strype’s Cramner, Appendix, p. f ^53.